Leaf cutter ants are interesting ants from the southern parts of North America, and Latin and South America. 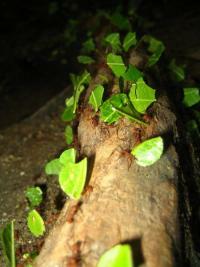 Unlike the carnivorous army ants, leafcutter ants are herbivores. In fact, leafcutter ants are the insect version of "farmers." They live in tunnels underground and send their foraging ants out to cut leaves and carry them back to the nest. Slightly larger soldier ants accompany the foraging ants and protect them while the foragers cut and gather leaves. 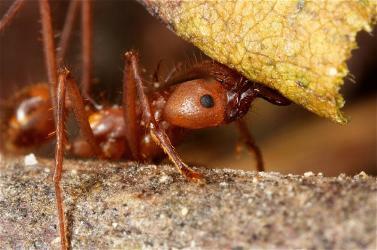 The foraging ants carry the leaves back to the colony and turn them over to smaller worker ants. The worker ants chew up the leaves and then feed the "mulch" to a fungus. It is the product of this mulch-fed fungus that is the ants' food. Each leaf cutter ant colony has one large queen that lays eggs. When a new queen is born she leaves the colony and takes a little of the fungus with her to start her own colony. Ants are generally known as a hard-working insect. Their colonies can grow very large. Some ants are cleaning and maintaining the tunnels of the colony their whole life. The ants are very efficient at their work. The ants are so efficient at their work you would think they are running a work order software operating system to handle the tunnel maintenance. A CMMS for your factory would work in a similar way, organizing your tasks and the worker's daily workflow. For a demonstration of leafcutter ants foraging for leaves, bringing them back to the colony, and to see what the ants do with the leaves, watch the You Tube video below. Image of leafcutter ant closeup by Yrichon aka Malin Björnsdotter Åberg photo-page (Own work) [CC BY-SA 3.0 or GFDL], via Wikimedia Commons Image of leafcutter ants with leaves (middle image) by MacAllenBrothers [CC BY-SA 2.0], via Wikimedia Commons Copyright © 2009-2019 RainforestFauna.com All rights reserved.